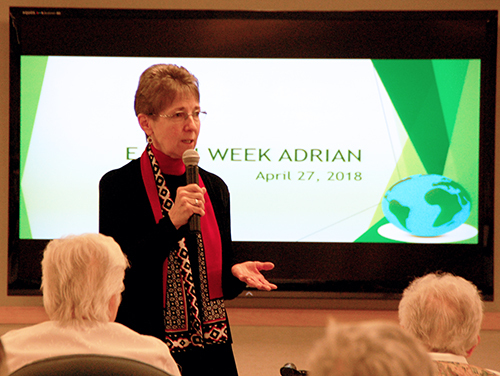 May 4, 2018, Adrian, Michigan – Sisters on the Adrian Dominican Motherhouse Campus celebrate the beauty of the planet during Earth Week, April 22-39, by discussing ways to live more sustainably to heal our planet from environmental degradation. The celebration began with the Mass of Creation, on Earth Day, April 22, with Father James Hug, SJ, Motherhouse chaplain, as the presider. Sister Corinne Sanders, OP, Director of the Office of Sustainability, offered a reflection. Focusing on the first letter of John, in which he writes, “Beloved, see what love our God has bestowed on us that we may be called children of God,” (3:1) Sister Corinne said she realized “the magnificence of the deep relationship offered to us – a relationship of deep knowing, a relationship of an intimate love binding us with God.” She added: “And as we continue to truly understand our place on this planet, this is a deep love, not only binding us with each other but binding us as creatures with all of God’s creatures.” The relationship of love is “between God and the fullness of Earth Community,” she concluded. Later that day, the public was invited to an open house of a local juried art exhibit, “Earth, Our Home” in the art gallery at INAI: A Space Apart, adjacent to Weber Retreat and Conference Center. Guests had the opportunity to view paintings, photographs, pottery, weavings, and other artwork depicting the beauty and vulnerability of Earth and its plants and creatures. Dana Schumacher-Schmidt, Assistant Professor of English at Siena Heights University, gives a presentation on food connections. 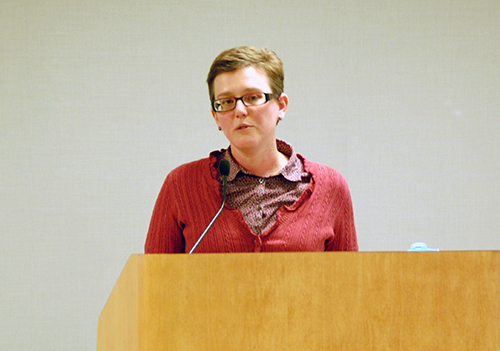 On April 24, Dana Schumacher-Schmidt, Assistant Professor of English at Siena Heights University, led a group of Sisters in a sharing on “Food Connections.” The discussion began with reflections on the people that participants connect with the food they eat – special meals made by their mothers, or a special family fruitcake. But Dana went on to discuss broader food connections. “I never thought about where the chicken came from or the people who worked with the chicken,” she noted. “It’s a marker of my privilege growing up that I never thought of where the food came from.” She gave the example of the origins of palm oil, used in a lot of processed foods. Harvesting the palms brings about deforestation, which affects animals and adds to global climate change, she noted. In addition, human trafficking victims have been forced to work on the palm oil plantations. Dana urged the audience to think about the connections between the food we eat and its impact on the planet and on other human beings. “Disconnect as much as possible from destructive systems and create more connections – source more food locally,” she said. Shared meals can also be a form of advocacy. Dana gave the example of the Siena Heights soup dinners, community-funding potluck dinners in which participants pay for the meal, watch presentations on up to four ideas on ways to benefit others in the community, and vote on the project they like best. The winning project is funded in part by the donations for the dinner. Elaine Johnson, Permaculture Specialist for the Congregation, discusses a local herb used to make tea. 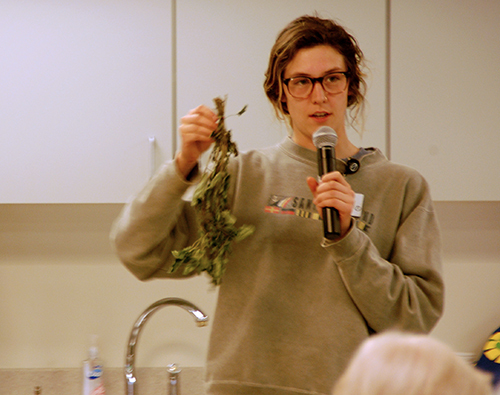 On April 25, Elaine Johnson, Permaculture Specialist for the Congregation, and Sister Carol Coston, OP, gave a presentation on teas that can be made from locally-grown plants. Sisters had the opportunity to savor the teas – and the connections they made to the surrounding land. In her presentation, Sister Nancy described how people of our culture moved from an understanding that everything is connected to one of separation – particularly the separation of humanity from the rest of nature and the idea that humanity can control nature to their advantage. She drew much on the work of Pope Francis in his encyclical, Laudato Si. The technocratic paradigm – the worldview that shaped the Industrial Revolution and pits humanity against the rest of creation – no longer works, Sister Nancy said. She described such a worldview as a habitual way of seeing the world, comparing it to the veil in a habit, which can limit the Sister’s peripheral vision. Just as cutting back the veil helped the Sisters to see more around them, a new consciousness of the interconnectedness of creation cuts back the blinders of the technocratic paradigm. “We’re cutting back the blinders that keep us seeing a very limited reality” and looking at creation in a more inclusive way, she said. Sister Nancy traced the shifts in consciousness throughout history: from early stages, in which people saw “beyond the surface” to feel connected to animals, stones, and trees and to recognize they were part of nature; to faith traditions in which spiritual leaders had the authority. The Catholic Church, part of this traditional consciousness, transcends the magic and myth of earlier days. With the Scientific Revolution, people put their trust in science, which taught them that what is real can be measured. “In the mechanistic worldview [of science], God is the clockmaker, and once he finishes creation, he leaves it,” Sister Nancy said.